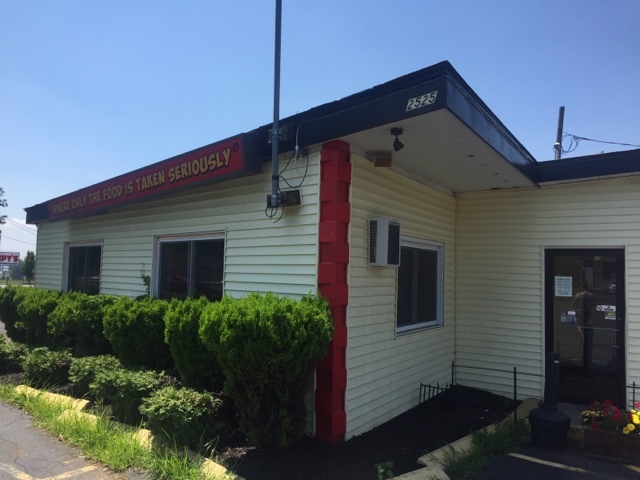 Some of the finest hot dogs in all of New England are found inside an unassuming little shanty in Newington, Connecticut. Doogie's has lines out into their lobby at lunchtime. All you have to do is try it once and you'll understand why. Doogie's has been featured in food magazines, raved about on TV. The very afternoon we visited, Fox 61 in Connecticut profiled Doogie's on their afternoon news. Doogie's has just about every topping imaginable for their hot dogs. They come in three different lengths: 10, 16 and a whopping 24 inches. 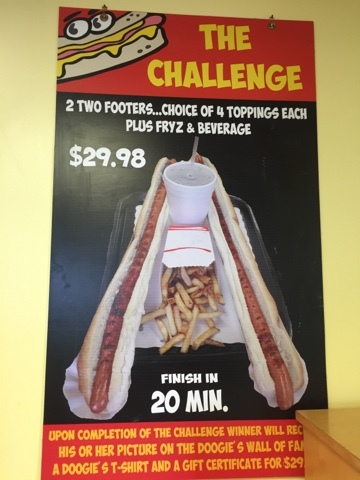 They even have a challenge: eat two two-footers, fries and a drink in 20 minutes and they'll but your picture on the wall and give you a gift certificate. Doogie's Dog include caramelized onions, kraut, chili, bacon-cheeze, chili-cheeze and a classic Coney Island dog with chili, onion mustard. 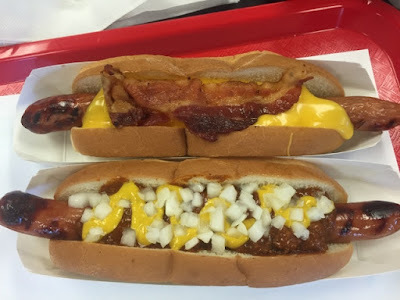 I LOVED their 10-inch Coney Island dog and their 10-inch bacon-cheese dog. So much flavor. They are amazing. 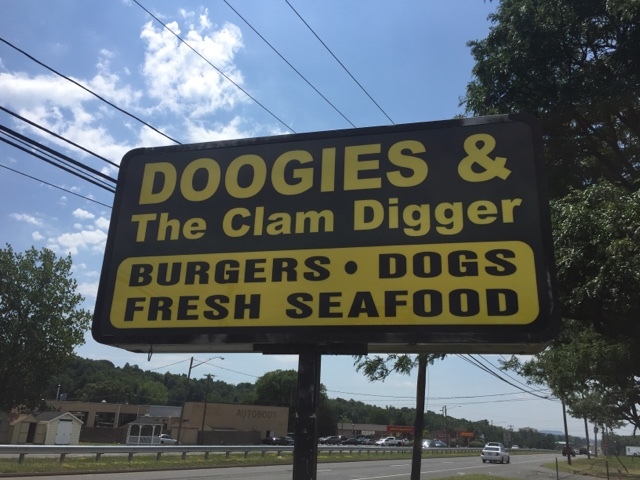 Doogie's also has specialty dogs. There's the Tijuana with jalepenos and melted pepper jack cheese. There's the Dixie with BBQ pulled pork and homemade cole slaw. There's also the College special hot dog. It only comes 16 inches and it's topped with chili, cheeze, bacon, kraut, onions, jalapenos, melted cheese on a toasted garlic roll with surprises. I wonder what those surprises are? They also serve cheese steaks, burgers and sandwiches. 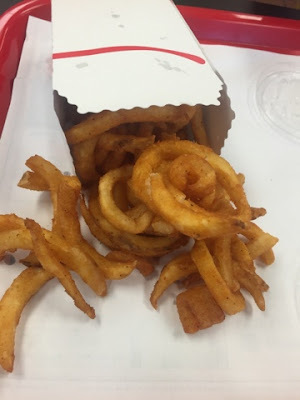 They have regular "fryz" and "curly fryz" which can be topped with cheeze, bacon-cheeze and chili-cheeze. Did I mention they also have a large seafood menu? My grandmother got the clam bellies. I snagged a few and they were pretty good. 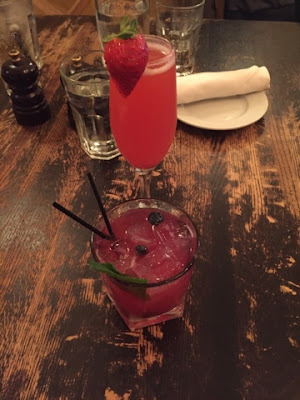 they also have lobster rolls in the afternoon. Shrimp, crab cakes and clam strips. There's also clam chowder and lobster bisque. Doogie's is just phenomenal. It's a must-try for any hot dog lover.